Historian Goldsworthy (Caesar: Life of a Colossus, 2008, etc.) 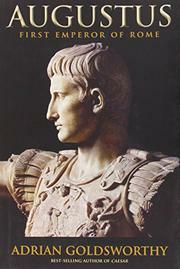 obviously has ancient Rome in his bones, and his biography of Augustus is also a solid chronicle of Rome and its development. Born Gaius Octavius, the great-nephew and adopted son and heir of the murdered Julius Caesar, Augustus emerged triumphant from the subsequent brandings, proscriptions and power struggles and was elected as the youngest consul ever. It seems everyone had his own army after Caesar’s death, and Caesar was shrewd enough to realize he needed to rely on talented men like Agrippa to defeat his enemies and take his place during his repeated attacks of ill health. It was also Agrippa who built the new infrastructures in Rome and throughout the empire. In fact, during much of Augustus’ reign, Agrippa did the work and happily let Augustus take all the credit. The author, who consults on documentaries for the BBC, National Geographic and other outlets, recounts the civilizing of Rome and makes sense of the political structure, as well as the strong reliance on family in politics and society. In Augustus’ 40-plus years of power, the empire expanded without the need for war—the reputation of Rome was sufficient to scare off any potential enemies. Augustus and Agrippa instituted new regulations for the army, trimmed the size of the senate, changed taxation, founded the police and fire services, and built roads, aqueducts and bridges. Augustus also made sure to visit each of the provinces. Instituting the beginning of 250 years of peace and stability, he was lauded by Horace, Virgil and countless others. Goldsworthy questions why Augustus has slipped off of many historians’ lists of great leaders, which include Julius Caesar, Alexander, Hannibal and Hadrian. He provides plenty of reasons why he should be at the top of those lists.